Wipeout is one of our newest and most popular games and is suitable for all ages (yes - grown ups too!). Not only fun to play but an excellent workout as well - not to mention hilarious for the spectators! The pedal powered arm sweeps across the inflated bed (and yes, you can choose to pedal or jump), you then have to jump over the arm while trying to keep your balance - difficult to do with up to 7 others all trying to do the same thing. Wipeout is available for fetes, fun days, and of course, parties - where you can take it in turns to see how quickly you can sweep your friends off their feet! 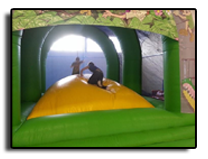 One of our most popular newer attractions and frequently booked for children's parties together with the bouncy castle. The Toddler Playzone is solely for the little ones and contains several mini areas to keep younger children entertained and stimulated for hours. Available for parties, fetes and fun days, please contact us for more details. This soft mountain, or air pillow as it is also known, is a bouncy castle phenomenon which provides the ultimate in a bounce experience. Difficult to describe the feeling (other than exhausting), but when you are on one part of the 'pillow' and someone bounces on a different area - you can be flipped off your spot! To keep the fun on Jungle Mountain, it is enclosed on three sides together with a large safety inflatable mat at the front. Quite simply:- put on your suit, grab your pugil stick, then try and knock your opponent's block off - before he knocks off yours!! Suitable for 8 to 12 year olds (approx.) 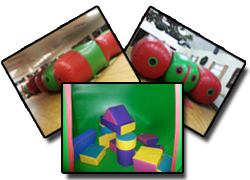 in a safe and exhilarating environment, with thickly padded suits and mats. Great exercise AND great fun, need we say more? Available for parties, fetes and fun days. Please contact us for more information and prices. A traditional, colourful bouncy castle enclosed on three sides. 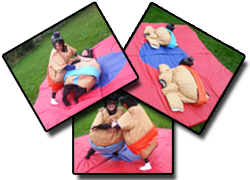 Perfect for all parties, fetes and fun days on its own or combined with one of our other attractions. Please contact us for more information and prices. 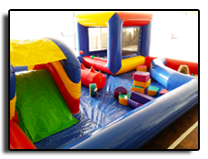 The enclosed 12 room play area with a variety of play equipment offers an alternative entertainment for the younger children. Available for birthday parties, fetes and fun days. 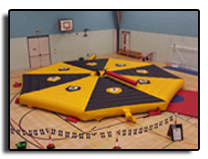 Covering an area of only 7.5 x 5 metres, it can fit into most village halls and the bigger gardens. 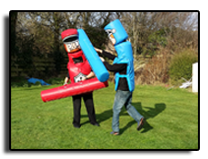 And yes, if you have spotted this on our other pages, the Caterpillar also has an alter ego as a laser tag arena - or why not consider hiring just the arena for Nerf parties - at least the ammo is contained within the battle zone!! 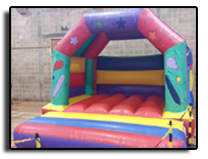 Wipeout, Jungle Mountain, Knock Yer Block Off, the Sumo Suits, the Caterpillar play rooms and the Bouncy Castle are available for a variety of fund raising events and school fetes with NO BOOKING FEE. A proportion of the day's takings are donated to your event, to be agreed prior to the event. Please contact us for enquiries.